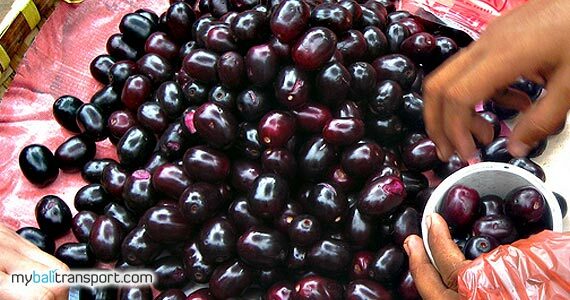 This purple fruit is popular by kids because it tastes sweet, fresh and little bit sour. In some areas in Indonesia known by different names. Like : Jambe Kleng (Aceh), Guava Kling (Gayo), Guava kalang (Minang kabau), Jamblang (Betawi and Sundanese), juwet or Duwet or Duwet Manting (Java), Dhalas or dhuwak (Madura), Juwet (Bali), Klayu (Sasak Lombok), Duwe (Bima), Jambulan (Flores), Raporapo Java (Makassar), Alicopeng (Bugis), Jambula (Ternate). 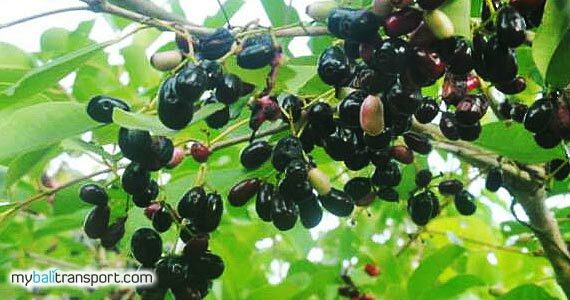 In some countries this fruit is known as jamlang, jambelang, Duwet (Malaysia), duhat (Philippines), Jambul or jamun or Java plum (UK). While in Latin (scientific) known as Syzygium cumini. Fruit Juwet live in tropical areas. The fruit is small reddish purple with a sweet taste, astringent, slightly sour and refreshing. In the past, juwet sold in Bali traditional markets at a bargain price. The fruit is very popular. Usually before eating thoroughly shaken with a mixture of salt in a saucepan. After eating the fruit of this juwet, mouth and tongue so purple. This is why children become like. Actually there is white types of Juwet that can be found elsewhere in Indonesia, which is known as white juwet, but is rare and less popular even though it tastes sweeter, fresher, and less astringent. Juwet tree grows wild in the garden, yard, hills, such as in Bali you will find a lot of these trees around the road to Nusa Dua Beach, Geger Beach or Ungasan hill area. Or if you are in the island of Nusa Penida, you will encounter this tree in the yard of the family house or residents. Fruit juwet Bali (Syzygium cumini) is still a family with cloves (Myrtaceae). High tree, can reach 10-20 m, and the wood used as building materials. For health, juwet fruit contains high antioxidant. 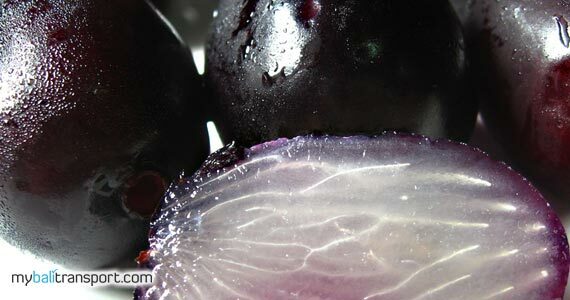 Caused by a purple pigment in the fruit known as anthocyanins. Juwet nutritious able to lubricates the lungs organ, stop coughing, laxative urine (diuretic), laxative fart (carminative), improve digestive disorders, stimulates saliva, and blood glucose levels (hypoglycemic). While bark of juwet efficacious for laxative menstruation. The results showed seeds, leaves, and bark of juwet also have effected for lowers blood glucose levels (hypoglycemic effect) in patients of diabetes mellitus type II. Have you ever eat this fruit Juwet?